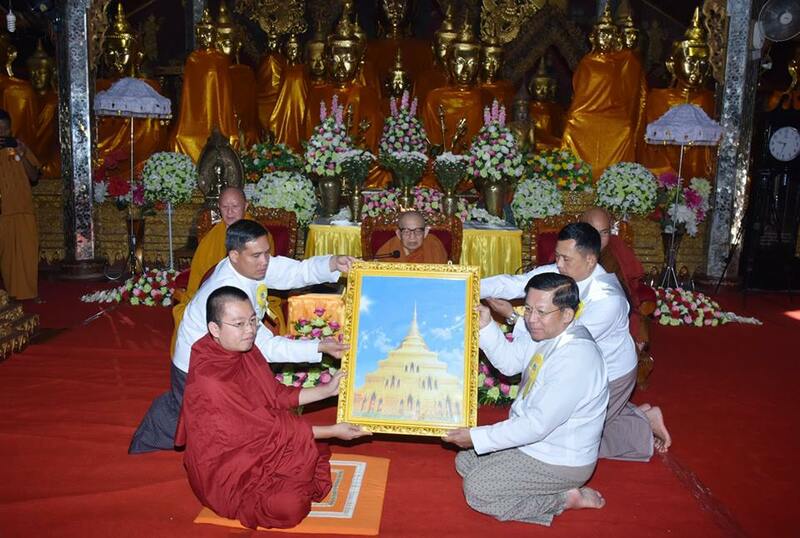 A ceremony to mark successful completion of offering gold foils at the whole Swamkham (Swamtawng) Pagoda took place at the pagoda in Kengtung of eastern Shan State in conjunction with the consecration ceremony this morning, attended by Abbot of Kengyin Monastery Agga Maha Saddhamma Jotikad-haja Bhaddanta Khemacara and members of the Sangha, Commander-in-Chief of Defence Services Senior General Min Aung Hlaing and wife Daw Kyu Kyu Hla, Commander-in-Chief (Navy) Admiral Tin Aung San, Commander-in-Chief (Air) General Maung Maung Kyaw, senior military officers of the Office of the Commander-in-Chief (Army), the commander of Triangle Region Command, departmental officials, well-wishers and guests. The Senior General and congregation took the Five Precepts from Abbot of Kengyin Monastery Agga Maha Saddhamma Jotika-dhaja Bhaddanta Khemacara and Parittas recited by members of the Sangha. 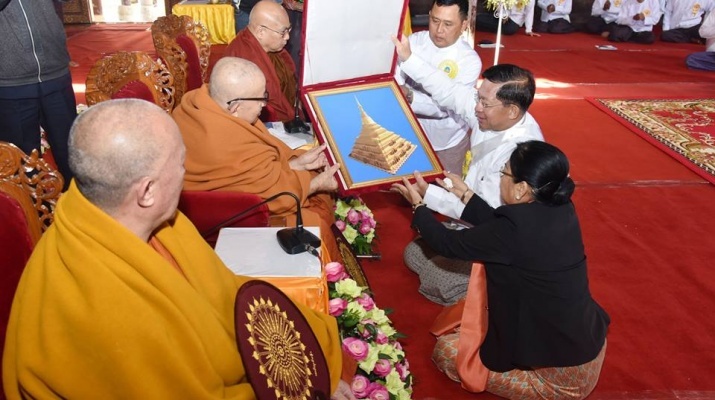 The Senior General and wife donated Swamkham (Swamtawng) Pagoda dedicating to the Lord Buddha to the Abbot of Kengyin Monastery and offered alms. 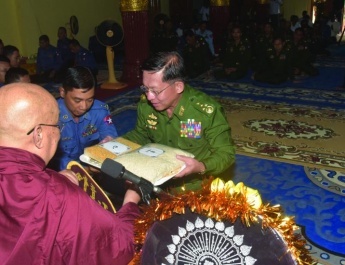 Senior military officers donated alms to members of the Sangha. Ashin Pariyattidhari of the Swamkham Monastery presented a certificate of honour and a picture of Swamkham Pagoda to the Senior General. Vice Chairman of the State Sangha Maha Nayaka Committee Loilem Sayadaw Agga Maha Pandita Agga Maha Saddhamma Jotikadhaja Dr Bhaddanta Pannananda delivered a sermon, followed by sharing of merits gained for all donations. Members of the Sangha concreted Swamk-ham (Swamtawng) Pagoda. 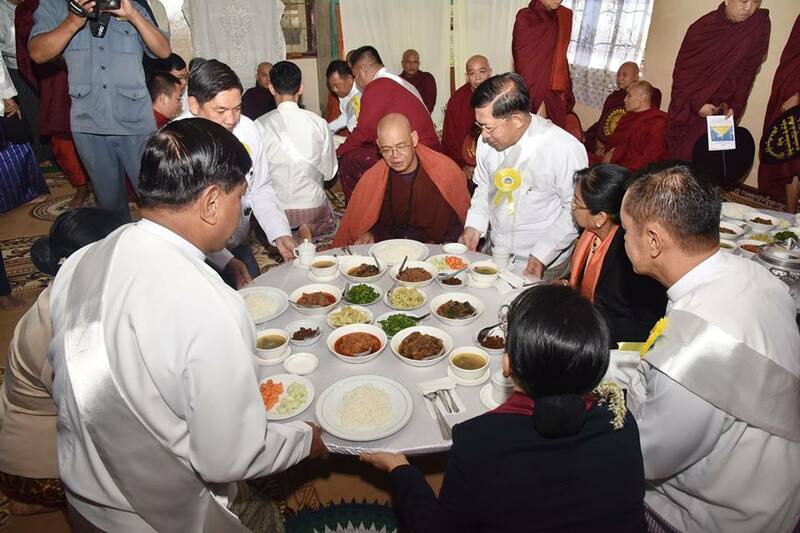 After performing the rituals of golden and silver showers in commemoration of the successful completion, the Senior General and wife offered alms in emerald alms-bowl, fruits, flowers and water to the Buddha image at the pagoda. Then, the Senior General, wife and party offered day alms to members of the Sangha. bad impacts of weather in 853 Myanmar Era. As rays from the pagoda covered the whole Kengtung at night of full moon day of Thadingyut in 871 Myanmar Era, the Abbot (Buddharattama Mahathera) and Kengtung Chieftain (Atitraraja) renovated the pagoda for the second time and hoisted the umbrella decorated with gold at its brim. So the pagoda was called Swamkham Pagoda. As the pagoda spread the rays again at dawn on full moon day of Thadingyut in 881 Myanmar Era, the whole Kengtung was illuminated. Nang Sugandara-kesa, daughter of the rich man from Swamwoe Village, renovated and built the pagoda and decorated the brim of umbrella with bronze. Hence, the title of the pagoda was changed Swamtawng Pagoda. Moreover, rays from the pagoda brightly shined on full moon day of Thadingyut in 1259 Myammar Era. As the pagoda collapsed in earthquake of Kengtung in 1266 Myanmar Era and it was rebuilt for the fourth time in 1296 Myanmar Era. 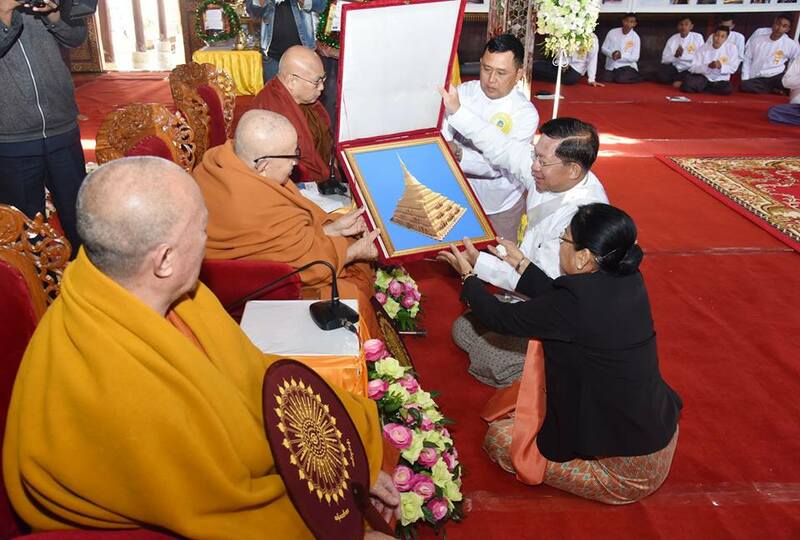 Kengtung Chieftain Chetaraparamarepanda, members of the Sangha and local people of Kengtung renovated the pagoda for the fifth time in 1313 Myanmar Era. They hoisted a gold umbrella. And it was renamed Swamkham Pagoda. In 1988, members of the Sangha led by Abbot of Kengngam Monastery Pakhu-wakyauk Bhaddanta Thitapanna and Abbot of Swamkham Monastery Pakhuwayinun and well-wishers offered gold foils to the pagoda for the first time. 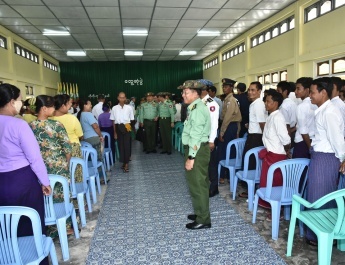 Members of the Sangha led by the Abbot of Kengyin Monastery, the Abbot of Swamkham Monastery and the Abbot of Naga Hnakaung Monastery, Tatmadaw families led by Commander of Triangle Region Command Maj-Gen Min Aung Hlaing and wife Daw Kyu Kyu Hla and well-wishers of Kengtung collectively offered gold foils to the pagoda for the second time in 2005. 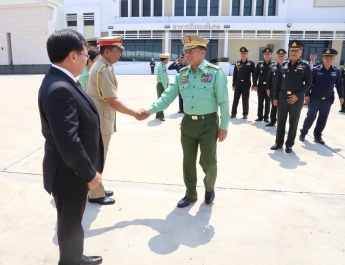 Commander-in-Chief of Defence Services Senior General Min Aung Hlaing and wife Daw Kyu Kyu Hla, families of the Tatmadaw (Army, Navy and Air) and well-wishers from Kengtung collectively donated gold foils to the pagoda for the third time in 2012. 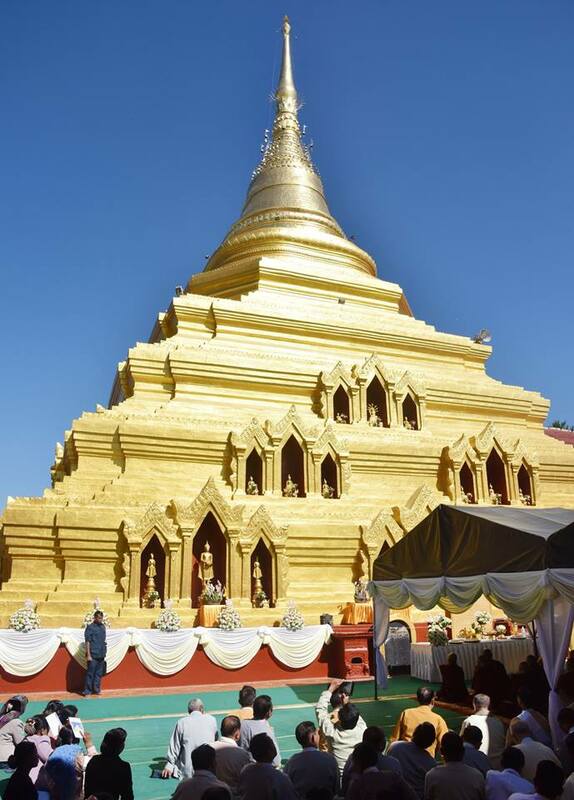 This year, gold foils on bronze plates were offered to the pagoda for the fourth time.